PAM: Welcome! 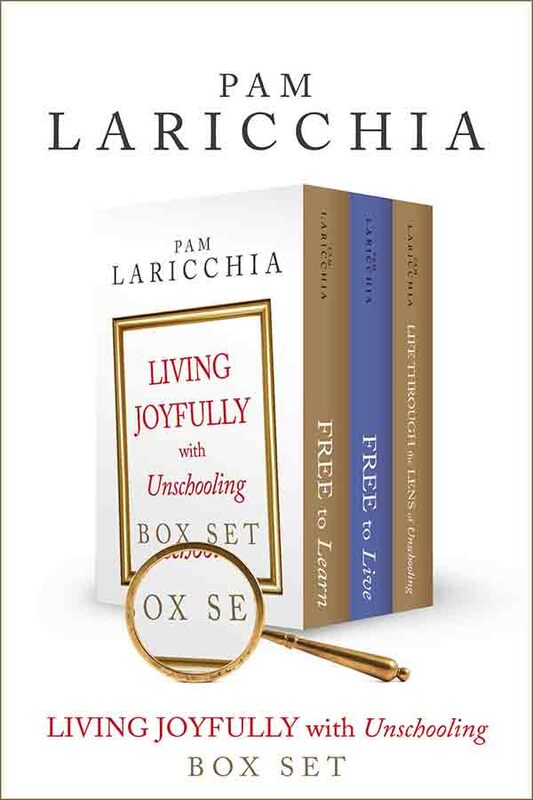 I’m Pam Laricchia from livingjoyfully.ca and today I’m here with Alicia Gonzalez-Lopez. Hi, Alicia! ALICIA: Hi! I am so happy to be here with you, good morning! ALICIA: Sure. 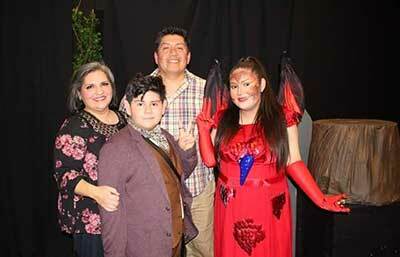 So, we’re a family of four: my husband Carlos, my darling daughter Elisa Marie, she’s 14 years old, and my baby Emilio Antonio, he’s 11 years old. We live in Phoenix, Arizona. My husband and I were born in Mexico, different parts of Mexico—he’s from the south, I’m from the north of Mexico. We met here in the states. We got married here. We met online, haha! We are that type of generation already! We had our kids here and we celebrated our 15th anniversary last November and we are happily living our unschooling life. PAM: That’s awesome and let’s get into that a little bit. 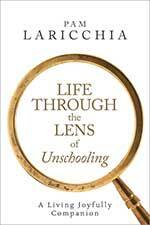 How did you actually discover it and what did your move to unschooling look like? 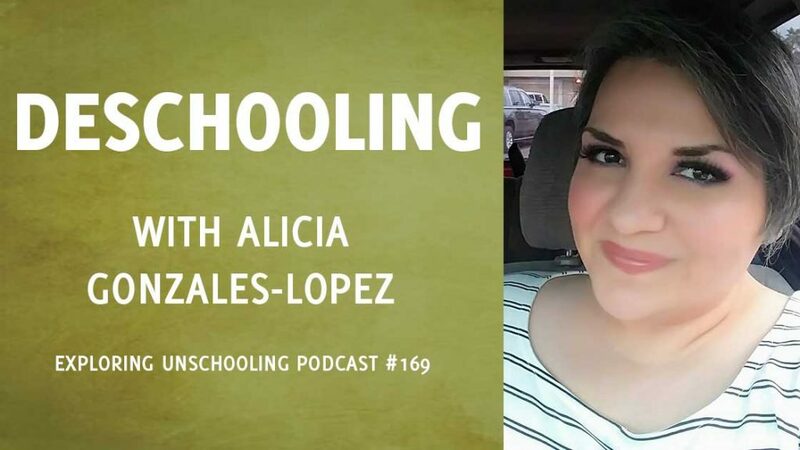 ALICIA: So, to answer the first part of that question I discovered unschooling reading online like could be the case for many people and for the second part I would like to do a little preamble and go a little bit back to the beginning of my parenting. When I was pregnant with my first baby, I never thought to do anything different than the traditional parenting that I was going to do and school and all the things. I was reading the mainstream pregnancy books but it wasn’t until I had my baby in my arms that I realized that I couldn’t follow the mainstream advice. I was not ready to let her cry or to put her sleeping in another room or not hold her when she was needing me. It was very difficult to be struggling with those things, the things that people are saying and things I was feeling that was right for me and my baby. So, my solution was to turn deaf to the world. I wasn’t listening to anybody, not even my parent’s advice, not my extended family (thank goodness they’re in another country I don’t have to worry about that) not even the pediatrician. It didn’t make sense to me so I said no, but at the same time I felt like I needed some guidance. I couldn’t do this on my own because I never saw somebody else doing it. So, I went to the wonderful world online and I discovered the parenting forums. At that time, they were forums not groups! And the good thing is that I found them in my language, my native language, in Spanish. 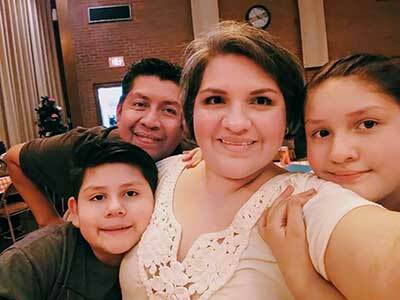 I really felt comfortable because at that time I spoke more in my native language rather than English and I was so glad to find other moms doing the same thing. I felt like, “Okay, I’m not the only crazy one here. I can relax a little bit.” I was learning. I’m glad that they were not just voicing their opinions but they were always backing up their information or sharing resources and books and websites and things like that. The more they shared the more I read and I spent all my sleepless nights with the baby in my arms, reading about it. I stayed in those groups for a few good years. It was in those groups that at some point the schooling, magical schooling topic was brought up. You know, you are just checking online, the posts and things like that but at that point I never felt the need to read about it. Elisa was already three years old at that point and I was just enjoying my baby. I was happy playing with her, knowing her a little bit more and reading too, for myself, and parenting and things like that. I was living the life because this was my dream since I was super young to become a mom and it was here! I was just living it! But I was curious and I started reading. First things mentioned around that topic was what method are you going to follow? Is it going to be Waldorf or Reggio Emilia and I was like, “Okay, I can read a little bit.” Actually, they kept discussing the things and one person brought the homeschooling word to the topic and she’s my best friend right now. We even bonded more in that moment. So, I said, “Homeschooling, what is that?” I never heard that thing. I promise you, never knew what it was. Never heard the concept much less someone who was homeschooling or homeschooled. So, I was curious and I read a little bit and I didn’t like it. I said, “No, I’m not going to prepare lessons, I’m not for grading and testing and at that point I had already been creating a sweet relationship with my daughter. I was always reading about gentle parenting and how to be more kind with her and unconditional parenting. 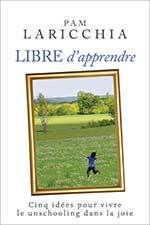 It was just like the book for me, from Alfie Kohn. She always gives me credit on how she jumped into radical unschooling. She says, “Thank you!” We started doing it. I never put a deadline of how long we are going to do this or that. We thought maybe Pre-K and kindergarten but it’s been ten years! It’s been a whole decade since we’ve started and I don’t think it’s going to stop. This is our way of life. We adopted it and we are really, really happy with it. So, it was amazing. And it’s not that unschooling came natural to us but it was a transition from attachment parenting to unschooling that was natural for us. We were doing some of the things that you do with unschooling. I was giving my daughter what made her happy. She was into certain characters. She liked Elmo and Sesame Street and all those things. We covered our whole apartment in Elmos and things like that because that made her smile. She was covered in Elmos all the time wherever she walked! We were respecting her times, just creating experiences for her, looking for some things for her to enjoy. While that happened, we were just living life with her, we were starting this schooling. My husband and myself we started this schooling and reading more so it was a good smooth path that we were walking together while we enjoyed our kid. At that time, I was already reading more English. It was already three years after she was born and I was so thankful to find all the generous people who were sharing their experiences on the unschooling life online I remember reading of course Sandra Dodd, Pam Sorooshian, Joyce Fetteroll, and you, Pam Laricchia! 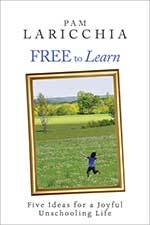 I was reading John Holt, too, as a support to understand how it works but I always tend to learn more about the regular unschooling part because it covers more all the aspects in your life. And in the beginning, that’s what it is, the kids are growing and developing a certain personality and things like that. It’s more of that part than the academics. But we were doing good. So, that’s how I ended up here! PAM: Thank you so much for diving deep into that! I loved hearing all those little details because I have talked before about how attachment parenting seems like it can flow right into unschooling but you know that wasn’t my experience because my kids, my older two, were in school before I discovered the word homeschooling like you described as well. ALICIA: Exactly! It didn’t break at any point. That was my whole goal to not disrupt anything in this line. We were sorting them out when she was growing up and it’s okay. I think it’s a very valid point for everyone who comes from different approaches as long as you want to do it because many of the people who started in those forums with attachment parenting, they didn’t homeschool or unschool. So, it’s different for them. They did what they did with their baby and for their kids and if academics was important for them well, they just do that. Everybody has their priorities and mine was the relationship. PAM: That’s spectacular! I was thinking back, I did not find the AOL groups about parenting. I felt the same way you did after my child was born. I started to deviate from the more conventional advice because I felt the relationship and the clues that he was giving me were important versus trying to get him to match. But I didn’t have an online. This was 1992, I did not yet come across that but just like you I shut out the world. I didn’t really talk about this to my parents much, to my in-laws much because I knew the advice I was going to get and then I’m just going to really, obviously not doing what they suggest. ALICIA: Yeah, just fly really low! PAM: Exactly, exactly! So let’s talk a little more about that shift, that deschooling shift on the parenting side because for many parents one of the challenges is that as we’re thinking about how we want to raise our children in this more connected and supportive and trusting manner, yet it’s very different from the way we were brought up and that can be really hard to do a lot of that processing and healing to get to a place of comfort. The juxtaposition, the difference between the way we were raised and we’re raising our children can bring up a lot of stuff from our own childhood. So, I was just wondering if you might talk to that a little bit. Was that your experience? ALICIA: Yes, it was in some parts and I’m glad that it happened in the beginning of my motherhood because it allowed me to just continue doing it instead of having these little gaps and things like that. I always say that it’s not fair to parent our kids from our fears. It’s just I think for me, like the flag that I just sailed with all the time and when I talk to other parents when they’re trying to bring up something I say, “Stop right there and let me tell you this,” so you can check what you are saying and thinking and things like that. So, I think it’s not fair not for our kids and not for ourselves. In order to give our kids a better life than we had, the life that they deserve and also to have a good parent/ kid relationship for ourselves. We didn’t have that when we were growing up as kids. Well, it’s time to redeem that part and now we’re going to be the parents but it’s still the same satisfaction and appreciation for the relationship even though you are the parent now. I think it is our responsibility as parents to be in a well state of mind and emotional health in order to do this job, at least for unschooling parents. I think you need to be really honest and humble doing this. Honest in the way you have to accept that sometimes you are wrong and sometimes you’re feeling your schooling and traditional parenting mind that you’re acting from, that part instead of doing the unschooling. And you need to be humble to recognize your mistakes ask for forgiveness from your own kids. That is just unthinkable in the mainstream world of traditional parenting to say, “I’m sorry I did this.” To say, “I’m sorry I lost my temper, I made you do this when you didn’t want to”, things like that. I don’t know, it’s just like a very humbling experience to be doing that. I am amazed at how this is transforming your own personal life when you are in that attitude towards your kids. I always remember the groups that I had when Elisa was little and the ones that I have now when I join to look for advice and keep learning and things like that. A lot of parents feel bad when they do something and they go to the groups and they say, “I don’t think I did good. I think I hurt my kid. I shouldn’t do that” and the other parents try to shoosh them and tell them, “No, no, no. You’re okay. You did the best you could” and I don’t think that’s good. I think it’s okay to feel guilty sometimes in order for you to get better, to recognize you didn’t do your best, so you can do better next time, make a better choice and be more kind to your kids or towards your husband. It’s okay to feel guilty. I don’t think people should be running away from that feeling because it makes you feel better at the end, makes you feel like, “So, this is not feeling good” meaning that I can do other things. I think that’s really important not to just run away from that feeling. PAM: I really love that because it’s so true. When something happens like that, when you’re feeling bad about something, that’s a clue that maybe the action that I took isn’t the one for the person or the parent that I want to be, that I am aspiring to be. So, it was just I didn’t reach there. So, not guilt as in to weigh you down and beat yourself up but also not to ignore it because if people say, “Oh, don’t worry about it, don’t worry about it. You’re such a good mom all the time” because when you do that, you’re just kind of burying it. You’re not going to learn more about yourself for the next time or similar situation comes up. I love that. You can see where they’re coming from because I think what they’re trying to help you avoid is feeling so bad about yourself that you shy away, but there’s a big difference. You did your best in that moment in that you just couldn’t reach as far as you wanted to but this is as far as you could go. But yes, that’s reality that’s okay. ALICIA: And when we know better, we do better. PAM: Right! To learn from it, to take that time to say, “How did I find myself in that spot where that was the best I could do in that moment?” Next time I’d like to do a little bit better, to take that time to think of what I do next time, what might my other options be and we have so much more to choose from the next time you’re there. ALICIA: Exactly and if it doesn’t feel right then it doesn’t align with the parent that you want to be. You can adjust and make changes and it just confirmed that’s all I can do and shrug, shrug. How are you going to change your life if you’re like, “That’s all I can do?” You can always do more. So, talking about that, the healing part and how we need to change ourselves, I know it’s not a popular opinion, something that I say, but even discussions about it with some of our friends, local friends here, but I firmly believe that our kid’s happiness and joy is our job as parents. PAM: They argue about that? ALICIA: They do! At least it is for me. I expect this to be a common thing for the unschooling parents. I’m not going to go into the mainstream parents, the school parents because that’s another world. But I think that when you believe this you make things happen for your kids and you take on the job and whatever it takes you just do it. And sometimes in order to do that job, to make them happy to give them that better life, sprinkle joy every moment in the life, sometimes you have to revisit your own childhood and it’s painful and it hurts but I think at the end it’s the satisfaction and the benefit of going through that is bigger than the pain that you can feel while you’re doing that. Sometimes it’s disappointing to realize things that happened in your life but it’s okay. In order to change something, you need to go and open them up and see what is in this box, how can we put order in this. 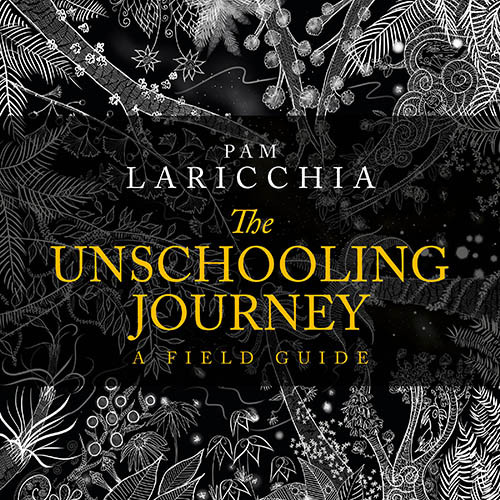 PAM: That’s so true because it’s inevitable, I think, as we start unschooling our kids to start imagining, “Wow, what if I had grown up this way?” Then you start really questioning what happened and then I think we can feel a sense of loss that we didn’t get to do that. I felt it even though my childhood wasn’t overly hard or anything like that. But I think one of the things I learned as I was deschooling was I can still embrace that now. If I didn’t get to do these other things as a kid but I’m an adult now, it doesn’t mean that I can’t have fun doing those kinds of things. Giving myself permission—that was part of the transition, part of the deschooling, giving myself permission—to do kid stuff. ALICIA: And believing you deserve it. PAM: Yeah! Soon, eventually you realize this is totally okay because it’s joy for everyone and then you realize it’s joy for us, too, and then it’s our whole family living together pursuing joy. I kind of think of it as the steps that I could take from where I am in this moment towards the things that I’m interested in. Which do I think would bring me the most joy, the most fun even for longer-term aspirations? What’s the one little step that I’m going to take next and see? For people who are like, “But life isn’t fun, life isn’t joy. You’re just setting them up for later,” that’s not the point! They learn the most when they are stepping in the direction they really want to go. They learn the most about themselves, they’re going to learn the most about whatever direction they stepped in. You are helping them learn the most in that moment about everything and that’s what you’d love for them all their lives, just taking that next step that’s going to light them up and see what happens and of course it’s not going to work all the time. ALICIA: And you are modeling to enjoy things, to enjoy life, being close to the things that make you happy and that’s okay and it’s okay even if you grow up. That part of you is showing them how to be happy, it’s what they are going to learn and that’s what’s going to stay in their minds forever, ‘Oh my parents used to be like that. My parents used to enjoy like that.’ It is great to be living this way for them and for ourselves, too. So, talking about how to touch those hurtful experiences—something that happened to me and it was the best thing that could happen. Parenting this way, even though I wanted to do it and I was ready to do it because I wanted to be a mom, it was pretty demanding. Not just in the physical way when you have a newborn but in an emotional way because she’s on you all the time, she’s eating from you, like your body is not your body anymore, it’s like a shared thing and you’re dedicating mind, soul, and body into this baby. So, I was doing it but I felt like it was exhausting me. The thing is in the same forums that I used to belong they talked about some books about motherhood from an Argentinian author. 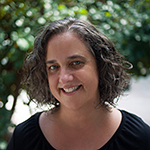 She’s a family therapist and her name is Laura Gutman. She has about five or six books and half of them are already translated into English. I got those books in order to understand what I was feeling and thinking about, not just the hormones and the feelings and the new plans with this baby. You have to kind of live day by day but at the same time you’re just thinking about the next day. It’s just impossible to not think about that and every way, ‘and when she reaches this age and when she reaches this age and this other age.’ When I was reading her she said, “It’s okay. You’re not crazy if you feel this way.” But if you are feeling like this is too demanding for you, it’s because you don’t have that part of you, your babyhood, it wasn’t all fulfilled in the mix when you were in that stage so it’s hard to give when you don’t have anything to give from. It was like a void, an empty thing. Even though I was enjoying my baby and my husband was emotionally and physically containing me while I contained my baby which is the right thing to do—the husband contains the mother and the mother contains the baby so the mother can fulfill all the baby’s needs without any help because she’s already satisfied, her needs are satisfied, it was still a lot. Her recommendation was to solve that, resolve that situation and if you have your mother alive and both your parents even better rather than go to a therapist and imagine the mother there if you don’t have it any other way. So, reading that and knowing that this was an obstacle in my life I embraced myself and took a deep breath and I called my mom. She used to live here in the city but I wasn’t receiving a lot of visitors at that time. So, I called her. My parents always worked so I was kind of part-time raised by my grandmother even though she was a very kind woman, she wasn’t my mother. I always felt like I was missing something. But you’re young, you’re little and you don’t know nothing about it and I couldn’t pinpoint exactly what was missing. Our relationship was a difficult relationship with parents, the school, and things like that but never super close because she was busy, I was busy. So, I said, “I have to do it,” and I called her and I told her how much I realized I needed her when I was a baby and now that I have my own baby, I know how much a baby needs her mother. I told her, “You weren’t there” and of course it could sound like I was being ungrateful but it wasn’t the Alicia adult talking, it was the the baby Alicia talking and saying I needed you. She tried to explain herself, of course, and tell me why she did that, why she went back to work after I was 30 days old, with my grandmother in the mornings and things like that. I said, “Yeah, but a baby doesn’t care much for vacationing Disneyland over arms, being held in the arms. A baby doesn’t care about new clothes but the closeness, the co-sleeping part.” We cried a lot. She ended up asking me for forgiveness and I did, of course, and our relationship changed. We got closer. I was intellectually grateful for the things that she did for me but honestly, I was grateful for the sacrifice but not only me as a baby lost her mother but she lost her baby. She didn’t have the privilege to raise me. I was able to see her as a mom now that I was a mom, too, and it was very healing for me because I think if I wouldn’t have done this I couldn’t be raising my kids and just surrender to my kid’s needs the way I did because it was something like, ‘I don’t have enough love. I don’t have enough attention. I don’t have enough to give them’ and now I can because it was like the baby in me was, “It’s okay, Alicia. It’s okay.” You find you’re loved. It was very intense but it was necessary to do that, for me. A lot of people don’t confront their parents that way because many things, many reasons. It could be it’s disrespectful, it supposed to be your relationship is part of the commands, you know. You don’t talk that way to your parents. I was raised in a Catholic family so I was the black sheep doing all those things but it was necessary and I firmly believe that from that moment my mom is starting to see me as an adult, too, as an equal which is great because some parents never see their kids as an adult. They’re always their kids. They always think less of them and don’t validate what they’re saying and at that time I think my mom put me on the same level as her and she not only respected my parenting choices but my personal choices so it was all around a better relationship with her. PAM: Wow that’s spectacular Alicia! The courage to make that first call, wow! ALICIA: Recognizing the first hurtful part is recognizing where they failed you and it’s okay to think of that. It’s okay to say, “Well, maybe I didn’t have that great childhood that I thought I had” and these people failed me and even though they were doing the feeding part, send you to school and private schools and things like that, still there’s the emotional part. PAM: And that’s all part of understanding a child’s emotional needs, like you said, this is something that you were discovering and feeling overwhelmed by yourself that your child’s needs and that’s what started you looking into it and discovering that pattern that repeats between generations. ALICIA: I wanted to add that when you are doing this, resolving these things, you as an unschooling parent, it’s very important not bother your kids. Don’t stop life for them. They can still enjoy and keep giving them what they need because it’s you that’s doing the personal work on yourself and they don’t have to be bothered at all. You can still provide that environment and of course the more you heal the more peaceful the environment is going to be and the smoother things are going to go for them, too. PAM: And I found, for me at least, making sure that I’m spending the time and having fun and bringing that joyful peace with them was also part of the healing because there was right in front of me an example of what they need. ALICIA: And don’t be so selfish because you didn’t have something, then they’re going to be missing that part too, because they didn’t allow you to do this. It’s selfish. You need to recognize that it’s not about you. If you weren’t allowed, now you’re allowed. You’re the parent. PAM: And like you said it wasn’t about blaming your mom. It was about sharing a revelation, an observation that was really true for you. ALICIA: It was a fact. ALICIA: And facts can hurt. PAM: That she moved through the defensiveness to think about it like we were talking about before when we’re feeling guilty about something because when you talked to her I imagine she was feeling guilty and our first reaction to guilt is to feel defensive, of course. But to take that on and say, “Okay, I’m not going to take that as a weight but I’m going to take it as a clue of something to dive into and learn more from and think more about” and your mom did that. That’s awesome. ALICIA: I think that she was moved when I said, “I try to put myself in other people’s shoes. I know you wanted to stay with me but you weren’t able because you needed to work in order to pay for these things and those things and my dad wasn’t very responsible and that’s why you felt the need to give us a better material life you had to go back and you thought it was the best and I understand that part.” It has to be just not one-sided. PAM: You did it with compassion because you understood her point of view. It’s like bringing a fact or an observation with compassion, not as an accusation. ALICIA: And you’re right. I’m glad she wasn’t defensive at all. She let her guard go down. She said, “You needed me and I’m sorry failed you.” That happened because we cooperated to make that happen. 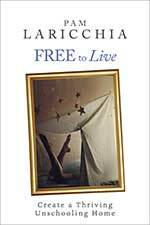 ALICIA: I just wanted to say there are many ways like self-help or books, like I did. There are therapists out there. There are different ways to heal from these situations. PAM: And try things out and see how they go. You can try some self-help books and if you’re still feeling out of sorts around it, like you said, there are different kinds of approaches. ALICIA: And remember that schooling is not just taking the kids to school. It is building a good relationship with them, a healthy relationship with them, and creating a nice environment for them, different from school so it’s not that it’s part of our responsibilities as unschooling parents to heal ourselves. PAM: Yeah! I know can you imagine trying to take that unhealed person and being that, trying to live unschooling now? It would be so hard. The next question was about the most challenging area of deschooling for you and how you work through it but what we were talking about there, without the healing piece, would that be what the most challenging bit was for you? 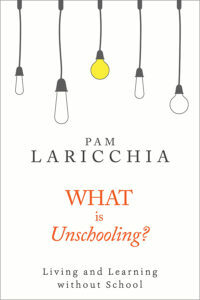 ALICIA: No because I wasn’t about unschooling. It’s not been that many maybe because I’m very positive towards unschooling and I see greater things than difficulties or challenges. But for me it’s always going to be the emotional part instead of the intellectual part. I think that when the emotional part is resolved, then the intellectual follows and as you were saying I didn’t break my relationship with my daughter. We were sorting out academics while she was growing up and I think it’s the same for this because I had a couple of examples of how emotional things were a little bit stopping me and it affects my relationship but I never stopped unschooling life for my kids, ever. I think it’s just very sacred, if you want to call it. It’s untouchable, it’s in a nice wonderful display and it’s happening and it’s just moving and enjoying but other things are happening on the side. One of those was always like expectations towards our kids. Elisa has a very strong personality, type A, very expressive, very outgoing and she says what she likes and when she doesn’t like but at a certain age when they say what they don’t like it sounds really disrespectful. What is this kid? So, it was that part. Of course, I read about it so it got sorted out. Another time she was older. She wasn’t behaving. All my kids are super sweet and kind and polite with everybody. A friend of mine, on one of my Facebook posts not too long ago, said that to know them is to love them and that’s true because they’re the sweetest things, interesting things out there. My kids always have super polite things to ask for things but it was just happening ‘out there’. At some point it just wasn’t happening in our home. She wasn’t displaying any gratefulness for the things we were doing or the life that she was having and it kind of upset me in a very bad way. It was just like a bump and it was resolved and we continued life but it’s always like that. It’s always the expectations that hold you back and it’s like the bumps that schooling says you have to do. With the academics I had a couple of things but it’s always a matter of waiting and observing and things are going to show you. It’s like you’re not paying attention enough to see the things, but they’re there. They’re always there. PAM: That was such a great point, Alicia! When I found that myself, when something seems off, when I’m starting to get uncomfortable about something that’s what I found by the time I remember that okay, what’s probably happened is I’ve disconnected a little bit with my kids because I’m missing something. Invariably I’m always missing something. Maybe it’s a new age that they’ve hit and there are expectations that I haven’t really had to think about because maybe it’s your oldest child has hit a certain age or your daughter has hit a certain age. Just whatever your personal pockets are of things or a behavior like you’re talking about. Something comes up like that and what it means is we’re missing a few pieces of the puzzle basically. ALICIA: Connection is a big thing. It’s connecting with them and you’re missing, your like, “Whoops!” something happened here. ALICIA: Or when you compare them, you’re just going to fail right there. Even among siblings. It’s not comparing them among school kids. I remember that with Emilio. Eliza made unschooling look so easy and that’s why I was just like, “Woo-woo!” I was confident about me! About myself in the whole philosophy because she started to read at four years old and by the time she turned five she was reading in English. She was a bilingual reader at five. It was amazing! It was like, “What is it that works?” But she has that personality that she shows what she knows. With Emilio, he’s all the contrary. He’s so shy and he doesn’t like for people to see his mistakes. He has to be really sure before he does something. He didn’t want to show but he knew how to read. I was sure that he knew how to read at five but he wasn’t showing it and I started to worry. I was like, “Oh my gosh! Elisa was reading in two languages at the age of five at this time. What is happening?” It was a matter of a few months later we were just doing a Lego instructions and he said, “I know that word.” I said, “Really?” and he said, “Yeah, this one, that one, too.” Okay, so I never went, “Are they going to be able to learn?” Never! Don’t close that file. And that disconnection that happened to me (thank you for that word) that happened to me two years ago with Elisa. She was 12 and I started wondering, “Oh my gosh! She’s going to enter her teen years and she hasn’t expressed what she wants to do for a living. 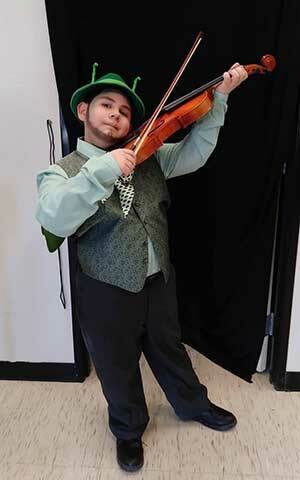 At 12 years old! Now that I think of it it’s like, “Alicia, do you need to know what you want to do for a living at 12?” I was barely finishing elementary. PAM: But you get tunnel vision, don’t you? Because you start worrying about something, you don’t see that bigger picture until you notice and take that step back and sit with it for a while. ALICIA: And sit and talk because even though she was 12, when I mentioned something, she already had it figured out. I mean really! She said, “Mom, don’t even go there because I’m done!” She knows. She has plans. She’s been having plans and she was 12. They’re full-time gamers so they want to go that route. It was kind of helpful for me. Not just to know and calm myself down. But I started to look for opportunities for her to make that happen for her now. So, it was very useful in that way, that I talked, I sat down. I thought they were doing so well. I was too relaxed! But I was a little bit disconnected with them. I thought you could share maybe a little bit about what connecting looks like for you guys because for some families this is something new. It’s not something they got a lot with their parents growing up. ALICIA: I love that topic. It’s my favorite topic in unschooling. I think connection in our family looks like the relationship. 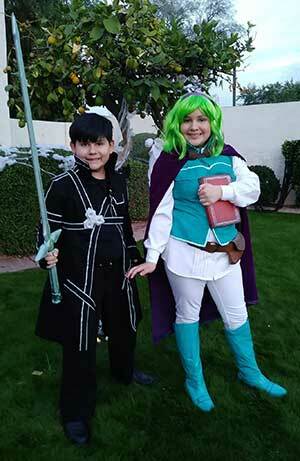 My kids are gamers, as I mentioned, and we have that in common with them. We don’t have to pretend that we like what they like because we honestly like what they like! I gamed when I was young, my husband, too. 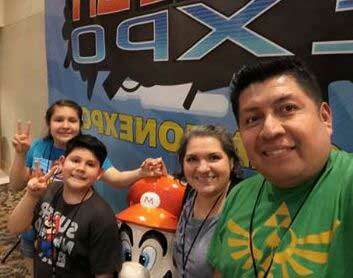 Even though we can create many examples of how you connect and the unschooling and the gaming world like sharing things and stuff like that but I think the relationship that we’ve been building all these years and how we’ve been treating them and they give us that back. For me, that’s when connection shows. Not just in the everyday life but in situations that are decisive and important for a family. We’ve been through three difficult times in our life as a family, one of them being the financial crisis that we went through for two years. My husband lost his job and he couldn’t find anything during those years. Life was really, really hard. We have my parents here and they were supporting us economically and some of our friends helped us even for holidays in one of those years. But the thing is we’ve been very generous with our kids all the time and I don’t see the video games or books or toys or pencils or whatever they want, as an expense but as an investment into their happiness. So, doing that, ensuring that all the time. When we were going through that situation one of the times we went to the store. They said, “Can we go to the toys and the electronics section?” and they requested something and we weren’t able to get it for them, even though they never knew for sure what was happening because why was it good for them to know that we are counting pennies in order to go and buy food? It was nothing good for them. PAM: You didn’t want to scare them. ALICIA: Exactly. It’s an understanding between my husband and myself that we don’t disrupt their lives for things like that. It’s not that they’re ignoring or in a bubble. How are we going to benefit? Are they going to get money? No, we’re not going to get any more money. So, they asked us and I say, “I’m sorry and I cannot get it for you.” Most of the time we get it right there in the moment, we get the stuff. Sometimes we have to wait a couple of days or hours or we will come back and things like that but that day we didn’t have a date to know when they were going to get that toy, that game. And they were very understanding. They never got mad, never cry, make a tantrum or anything like that. 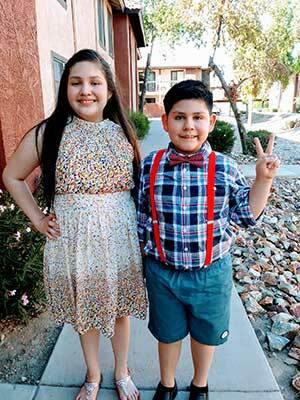 They were really young like eight and 11. They knew it was an honest answer that I cannot get it. When we have money, if you still want it, we can come back and get it for you and it was amazing. So, for me, it showed me that how much they were being supportive of that situation and did their part in order to happen. Another thing that they showed me, the most sweetest thing is last December I got an emergency surgery because it was an emergency and I had to stay longer than a regular surgery. I stayed a whole week in the hospital. I have family here so I’m 24/7 with them. My husband goes to work and when he comes back we have family time but we don’t (before we started our recording I told you we don’t wake up until noon). That’s our time and my husband works super early so my kids, while I was in the hospital dealing with all the medical things happening for me, they had to go to work with my husband every day at five in the morning for five days. My husband told me that they never complained. Not one bit even though they had to wake up early, sometimes being a little hungry because there wasn’t much time to eat, and wait for him all those long hours. They never complained and that for me is connection. They’re showing me that we’re family, we’re here for each other, we have their support, we have their respect, and they care for us and they want these things to work well. For me, that’s the max that you can show how connected you are as a family. PAM: That’s awesome! Yeah, and they’re giving back what they’ve received in bulk! For those years that is exactly what you’ve shown them. That’s their example. That’s the model and they know how good that has felt for them and they’re happy to respond in kind when situations come up. ALICIA: A lot of parents have told me that, “They need to know and they need to suffer with you.” Why? I’m the adult here. I’m responsible for this situation. Why am I going to make them go through something that is not even beneficial? They’re not going to learn anything good from suffering so for me it’s not good advice. PAM: For me, what I found, is it’s really about what they need to know, what they want to know, as in they can sense something’s up and they can flow with it. And if they’re curious, they want to learn more, they’re going to ask questions and you’re going to answer it at their level, like you know them and you know what they are searching for. But to pile things on that they’re not asking for or needing can needlessly bring fear into their lives when things are uncertain. So, I still always use my kids as that barometer. It’s not me. Do I feel the need to release it? Well, then, I’ll release it to my spouse or my friends, whoever I need to talk about it but it’s from their perspective. If I notice they’re feeling uncomfortable and out of sorts then I’m going to give them more information. ALICIA: It might be out of place because they don’t know what you’re going through and they think you can do certain things and maybe you are in pain. That’s when you say, “You need to wait because right now I cannot move”, so they understand but when they didn’t have that information that’s why they were acting that way, not because they’re super inconsiderate. I just say, “Give me some time, give me a moment and I’ll get to that” and things like that so it’s not that I want to be the hero, but there’s no need for me put a lot of stuff on them. You have this vision of who you are as a parent and you find that you kind of need to be a different kind of parent, do different things with different children so I just thought had that been your experience and how do you figure out what it is that they need from you? ALICIA: A very good friend of mine told me once that in order to be a good mother/ a fair mother you’re not going to give all the kids the same things equally, you’re going to give them exactly what they need and that’s true. That’s the best thing that you can listen from somebody in order for you to do this thing. With Elisa it was really easy because we have the same type of personality and she being the first I had all the time to play with her and know her and I was just focused on her so for me it was just so easy to read her. She didn’t even have to cry, when she was a baby, in order for me to know what she liked, if she didn’t like something. I think it was my husband’s ex boss that we took the kids sometimes to work and they never heard them cry and both cases when my kids were little and the boss would say, “Do your kids ever cry? What is wrong? Those are the only kids that I know never cry.” Crying was the last sign that I wasn’t paying attention to her so it was so easy for me to just keep giving her what she liked and enjoying her and we’re walking together and learning together how to be mother and daughter and with unschooling, obviously, because she started first at four. Emilio, it was a whole different world. I was so not prepared for this. He has the personality of my husband and I never met a sensitive person as much as he is. What is this? How do I do this? When he was a baby, of course, babies are content with arms and milk and co-sleeping things like that but when he grew a little bit older and start expressing, I didn’t know where his feelings were coming from and what he thought of that. I never did something to make him feel this way and he’s feeling this way. What am I going to do? Carlos spoke up and said, “I know why he’s feeling that” and I thought, “Really, because I cannot get this kid.” So, he was a little bit of a translator with Emilio, to understand where he’s coming from and the fears that he was expressing why he hesitated in doing so many things. It was hard for me but even though I didn’t have sometimes all the words I was there for him holding him and just making him feel safe and loved but I think Emilio has been a challenge for me in that aspect because it’s very different for me and I needed help and thank goodness my husband explained and it’s been healing for him, too. He told me this that it’s been healing for him that being that way and he couldn’t be raised this way but knowing that he can provide this for his kid it was just beautiful. I’m so glad because I’m mothering my husband a little bit but through my kid. He feels really happy with his kids that we are doing this life. Knowing the kids it’s just going to allow you to give them what they want getting involved in their lives is what the key for this thing. PAM: I love that. I love what you said at the beginning to that fairness isn’t about equal. I think that is such a key piece to learn because from there you can start to recognize embrace how individual your children are. How completely different they are and I think at the end when you are connecting with them as the people that they are, then you all feeling equally loved. They all feel very much loved even though you’re doing completely different amounts of time with them or amounts of money than what you’re doing or the number of things that you’re bringing, just all those kinds of things and it changes that’s a really neat thing, too, because it changes over time. Sometimes you’re looking for more sometimes they’re busily engaged with a lot of what they’re doing themselves and just taking the pulse. ALICIA: You don’t create those, one doesn’t feel like you’re giving more to the other so that helps you not to just make them feel that way like you’re paying attention everyone receives what they need and they’re happy and satisfied at the same time. PAM: I found that exactly, too. I actually wrote a whole talk about it and it’s called, “A family of Individuals” and it’s all about how when we as a family want harmony but it’s not about insisting that siblings get along, it’s about each of them, what they all need so they’re not in competition. They don’t feel in competition with one another. Okay you know what I’d love to know and this is our last question, too. I’m excited to hear what has surprised you most about your unschooling journey so far? ALICIA: I think it’s going to be my motherly self talking here. It’s not just a relationship that I have with my kids that I missed with my parents but the relationship that they have between them. I have one brother, too, and we are the same difference in age as my kids are. I was never friends with my brother. He went to one grade, I went to another grade. We had our friends but right now as adults we make an effort to have a relationship but it wasn’t something that started when we were young. This is thanks to unschooling that my kids are growing together, they’re being treated with what they need, with respect and love and they treat each other that way. So, for me I can leave this world in peace because I know that they have each other’s back because you kind of feel alone even when you have siblings if you don’t have that relationship with them when your parents leave if you had a relationship with them the connections get lost and the family thing is that for me it’s that and they love each other they protect each other. They may not agree on a few things but they never fight, not physically, not cussing, they don’t wish ill. It’s beautiful to see. Even if you are a school parent you wanted them to be doing certain things you wouldn’t imagine the way they are following their passions. It’s just like he lives in it all the time and I do too but since I’m more emotional and he’s more intellectual he gets surprised by the things that they learn and when we sit down and watch a show together the interactions that we have and the ideas that they share and their opinions they’re so well thought they’re so honest. Here on Earth their values, they’re honorable people they’re honorable at 14! How can that be possible that they are more honorable than many people that we see out there!? That’s what amazes us. It’s been fun, it’s been great. Everything’s amazing and satisfying. PAM: Wow, well that’s spectacular and that’s one of the coolest things is that like you said if we had sat down and planned how the kind of children we would like to have- honorable, knowledgeable, and all this kind of stuff and we could never have planned on a life as amazing as it is unfolding. ALICIA: And I think we didn’t enter with a wrong expectations or looking for a certain result. We didn’t say, “I want my kids to do good in school because I want them to be more smart.” So, when you enter like that, you’re expecting them to do this and that and accomplishing this. We didn’t enter it that way so what is happening in front of our eyes is just amazing. It’s just like an act of magic all the time, happening here and there. PAM: Oh, I love that! Well thank you so much for speaking with me, Alicia! It was a wonderful conversation. Thank you so much! ALICIA: Thank you I’m really happy to hear that. PAM: I so appreciate that you took the time to do this. And before we go, where is a place for people to connect with you online? ALICIA: Well you can connect with me on Facebook. I have a radical unschooling group there it’s called Radical Unschooling in Español. It’s an all Spanish group and also inspired by you, me and my two best friends we created a podcast in Spanish it’s called Voces de radical unschooling. Voices of radical unschooling. We don’t have that many episodes because it’s hard to coordinate three houses. We have kids of similar ages and everyone’s busy doing things but we’re ready to do more this year so you can connect with me there. I’ll give some links to you, for somebody who wants to hear it in Spanish or wants to learn Spanish. PAM: That’s spectacular! We will put all those links in the show notes. Thank you so much! Have a great day! ALICIA: Thank you. 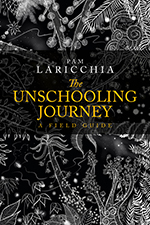 Happy unschooling life, Pam!